A few days ago I was watching a news bulletin concerning the recent severe winds in Scotland, and mention was made that a fishing vessel was in difficulties out at sea. I thought that was only to be expected, but was amazed to hear that this particular craft was Spanish! Now I understand that the, once proud, Scottish fishing fleet has been decimated over recent years; apparently to conserve fish stocks. If this is the case then why, on earth, is it considered acceptable for Spanish boats to take a share of this dwindling resource? As well as fishing our waters, we are even extending the use of our coastguard these days to rescue Spanish fishermen when they ‘get into trouble’ in their boats. What gives? Don’t we have enough problems with British industry? A little research will show that our own fishing fleet has been in serious decline for decades and things aren’t getting any better. 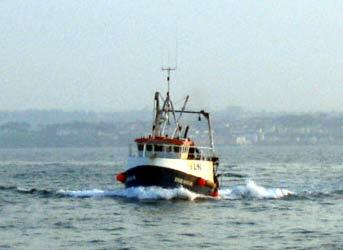 Around fifty years ago the industry employed upwards of thirty thousand fishermen. Today’s fishing fleet may be lucky enough to get into five figures, however information regarding that is pretty sketchy so I am unable to verify this. It looks to me as if those in charge are just selling Britain by the pound and don’t really care about our fishermen and their families. I just find it very sad that a once great fishing industry appears to have been just handed over to our European neighbours on a plate. What next, our oil and gas reserves? What's left of the coal industry? Britain is an island surrounded by water and fishing has part of our heritage for generations. Why have successive governments done this and destroyed the livelihood of so many? Why do they continue cave in to the demands of other European countries? Has anybody read www.brit-exit.co.uk and read the fisherman's page. I really do hate tasteless and disgusting farmed fish. I want the real fishing industry back, with fish and chip shops selling real Atlantic cod, all nice and flakey, and clean, and at a reasonable price. If there has been over fishing it's because others in the EU have stolen our fish, at a cut price rate, or because we now have far too many people living inthis country due to over immigration. I am sorry if this sounds outlandish but would there be anything wrong for the UK fishing industry to support the creation of 'reservations' in which fish stocks could recover? I suggest that UK fishermen support the sinking of wrecks and undersea obstacles which would block, contain and divert overfishing as done by trawling using large, fine meshed nets. It would be a good use of old cleaned ships and as is well known wrecks allow fish stocks to increase. Do it within UK waters and over time perhaps the fish would come back in commercial numbers. Do it in international waters and it might also affect the work of foreign trawlers in whichever area such undersea wreckage might be placed. According to the EU, the British fishing fleet was too large, this led to grants been issued to fishermen in return for their boats (this was around 2004), if this isn't outrageous enough, rather than selling the vessels for other use eg. pleasure boats, private use, or even to third world countries, the uk government demanded that all boats should be destroyed to prevent them from ever returning to the waters to fish. It wouldn't appear too far fetched to assume that large sums of european money have been effectively issued to the uk government in order to destroy what is left of the uk fishing industry, and to stir up matters a little more - I'm told we have spanish vessels now coming within a few miles of british shores. How sad and stupid - the whole thing seems to me to be a fiasco for the fishermen. How does any of this really help anything? Who is making these decisions, why, and why isn't anyone ever consulted as to a sensible way forward? There's nothing wrong with european trade, but when it destroys the core industries that a country does best, its utter short sighted foolishness. After decimating our fishing fleet,Europe is hell bent on doing the same to our armed forces. When Churchill said we should fight them on the beaches he didn't forsee us fighting them in Whitehall,County hall and the town hall. Britain is being destabilised in order to ease its absorption into Europe. A multi-billion pound industry given away by Ted Heath. He should of been hoisted by the neck. On the yacht he mysteriously came into ownership of. No mistake, every member of this Government is guilty of high treason. Giving our waters away is like telling foreign farmers to come over here and plough away. Captain Birds Eye here from Walton-on-Thames. I never did go to sea. I was wholly a marketing creation. They liked my beard. Most I ever caught in my life was couple of carp from the Thames at Walton bridge. Some said they saw an alligator swim down the the River Wey Navigation. "Only the best for the Captain's table"! For the bloke who said fisherman should push trolleys at tescos, you belong at the bottom of the ocean son, fishing in many families is a tradition that has been passed on for countless years, I would rather go to sea work long and bloody hard to put food on the table than any job in the world, why you mite ask, to me fishing is more than a living its a lively hood. Personally,I Love fish.I cannot get enough,a big thanks to our uk fishermen/women.Our Navy should be here in the north atlantic policing the spanish and Icelanders not over there in the persian gulf. The fundamental principle when sharing anything is that the giver needs to ensure their own share is secured first otherwise it is unsustainable and ultimately ends in folly. The disappointing fact about the UK fishing industry is that the UK government is guilty of stealing from UK fishermen to give common fishing resources rights to EU. The UK government should be taken to court and made to pay for their appalling treacherous deeds. Close the fish 'n chip shops. Burn down the Youngs and Birds Eye factories. Sink the foreign fishing vessels in our waters. Close the firshing ports her. No more eating fish for 200 years. And don't be taken in by ridiculous claims about being "line caught".